Published February 28, 2018 | By Min-Seok Pang, Ph.D.
Amrit Tiwana from University of Georgia will be visiting Fox School as a visiting scholar for a week on March 12-16. The department is scheduling his visit, and I invited him to join us in our seminar for 30 minutes on March 14. If his visit is confirmed, I will add this paper to the reading list for Week 8. Tiwana, A. and Kim, S.K. (2015) “Discriminating IT Governance,” Information Systems Research (26:4) pp. 656-674. Why do we go to conferences and introduce our research? If you are selling a product (say a laptop), are you going to start with all the details of the product you are going to sell (e.g., screen resolution, battery life, etc.)? No. In most conferences, you only have 10-20 minutes. The shorter the time, the more difficult it is to give the talk. How are you going to present your research in only 15 minutes? Cut down literature review, but then lit review, methods, results, discussion. That sounds like a 20-minute talk. In a shorter amount of time focus on ideas, contribution, and motivation. Think about what is the most important aspect of your research (though literature review and methods are important, you don’t have time to introduce these aspects in only 12 minutes)? I expected feedback on my research at conference talks, but I haven’t had much luck. It’s really about introducing / marketing yourself and your research – you speak English well, you are an engaging speaker, etc. To your advisors point that technical aspect is most important part of the research, that is true to some extent. He is trying to sell you as a rigorous, well-trained person. If that’s the goal, that’s helpful advice. Different people, even at different conferences, have different tastes. Traditionally , outsourcing deals require long term contracts between clients and the vendor and this has been a major area of focus of most of the previous literature. This has also lead to frustration on the part of pretensioners who seek sustainable value from outsourcing. The paper focusses on renegotiation of contracts and investigates the role of decision rights delineated ex ante that enable Pareto improving amendments. Specifically, the authors looks at the effect of flexibility provisions, termination of convenient rights and redoployability rights on part of the vendor to areas outside the contract on likelihood of pareto improving amendments against the default outcome of parties completing the contract without ex post renegotiation. Two empirical challenges had hampered previous studies namely: lack of good data and lack of rigorous identification strategies. The author was able to overcome this problem by using 10-Q, 10-K, and 8-K filings of firms(SEC) coupled with data from press releases, trade and business reports and press releases from client and vendors.The authors use a probit model for their initial analysis to find the probability of presence of Pareto improving amendment of a contract between client and vendor where as the Ivs include decision rights delineated ex ante, the characteristics of the task contracted upon, contractual provisions, vendor specific characteristics and other client characteristics(including other controls). The results show that flexibility provisions, termination for convenience rights, and contractual rights whereby vendors are granted rights to reuse know-how result in Pareto improving amendments. . The results are robust to potential endogeneity of contractual provisions when parties have the feasible foresight and to the possibility of adverse selection in the sample. The research contributes to literature by bringing in the angle of renegotiations in contractual decisions highlighting the importance of renegotiation design in enabling adaptation ex-post. It also has implications for practice. Few limitations of the analysis include long term knowledge spillovers(due to redeployability) and noncontractual mechanisms of enforcement which may affect ex post renegotiation. Paper: Gopal, A. and Koka, B.R., 2012. The asymmetric benefits of relational flexibility: evidence from software development outsourcing. Mis Quarterly, pp.553-576. The authors focus on a critical manifestation of relational governance – the presence of relational flexibility in the exchange relationship – and argue that the enacted observation of relational flexibility is driven by perceptions of exchange hazards. The authors propose that the benefits accruing from it are asymmetric and depend on how the exchange risks are apportioned by the formal contract. They hypothesize that relational flexibility provides greater benefits to an exchange partner that faces the greater proportion of risk in a project, induced through the contract. In addition, they hypothesize that these benefits manifest on the performance dimensions that are of importance to the risk-exposed partner. The authors test these hypotheses on 105 software projects completed by a software outsourcing vendor for multiple clients. The results show that relational flexibility positively affects profitability in only fixed price contracts, where the vendor faces greater risk, while positively affecting quality only in time and materials contracts, where the client is at greater risk. The analysis provide evidence for the asymmetric benefits from relational governance, thereby arguing for a more contingent and limited view of the value of relational governance, based on risk-exposure, rather than the more expansive view prevalent in the literature contending that relational governance provides benefits for all parties to an exchange. Gopal, A., & Koka, B. R. (2012). The Asymmetric Benefits of Relational Flexibility: Evidence from software development outsourcing. MIS Quartely, 36(2), 553–576. Situating the vendor-client relationship in the center of a series of economic and social interactions between organizations. As exchange hazards increase in the relationship, formal contracts are limited in their ability to rein in opportunism due to their incompleteness. Thus, relational governance plays a critical role in the relationship. There are two gaps in current views, one is assumption that these enacted relational mechanisms provide symmetric benefits to all parties. The other gap is, how is value from relational governance captured for different parties in inter-organizational economic activities. This paper argues that the enacted observation of relational flexibility is driven by perceptions of exchange hazards. This paper proposes that the benefits accruing from relational flexibility are asymmetric and depend on how the exchange risks are apportioned by the formal contract. In addition, it hypothesizes that these benefits manifest on the performance dimensions that are of importance to the risk-exposed partner. These hypotheses are tested on 105 software projects completed by a software outsourcing vendor for multiple clients. The results show that relational flexibility positively affects profitability in only fixed price contracts, where the vendor faces greater risk, while positively affecting quality only in time and materials contracts, where the client is at greater risk. In contrast, the impact of relational flexibility on quality is higher in T&M contracts where the client bears the greater portion of risk. The findings highlight the need to establish risk exposure first, and then examine the effects of flexibility on performance contingent on risk exposure. They also highlight the implications of relational governance for the performance dimensions of interest. In addition to the theoretical contributions, this paper also makes a methodological contribution by using a triangulating approach to examine the endogenous interactions of relational flexibility and contract type on project outcomes. Given the sourcing trends are unexamined fully, the paper establishes two research goals:1. assess whether organizations are trending toward one sourcing approach over another;2. examine the extent to which organizational antecedents influence the relative rate at which organizations move toward a specific IS sourcing configuration. Specifically, what’re the answers in the context of healthcare and sourcing decision within EMRS (Electronic Medical Record Systems). Under the theoretical framework of institutional theory, the authors identify several factors that may impact institutional pressures and therefore influence the adoption decision. 1.strategic orientation, more specifically, whether a hospital is for-profit or not, teaching or not; 2. formal structure, including hospital size and hospital health system size; 3. Case complexity. It mainly uses two data sources: HIMSS database and HospitalCompare database. Thus they can capture the modules that were integrated into the EMRS, the associated suppliers and the contract year, then they can construct the patterns of implementation over year.Then they code sourcing strategies and compare sequence similarities using a matching algorithm by R. Every hospital receives a score based on how many moves it would take to transform its sequence into the prototypical single-sourcing sequence. For the independent variables part, they mainly focus on five variables, which are antecedent, and their interaction with time. The result shows there is not a statistically significant interaction between time and FP hospital; teaching hospitals move toward single-sourcing more quickly; Hospital with higher CMI is more slowly in adopting single sourcing.As their hypotheses put, the size of a hospital has a statistically significant negative interaction with time, but it is not the case for the size of the hospital system. They also give reasonable explanations for the inconsistency. The paper has several theoretical and managerial contribution. For example, it uses a novel sequence analysis approach to quantifying sourcing configurations. What’s more, it illustrates the how institutional factor influence sourcing strategy factors. Angst, C.M., Wowak, K.D., Handley, S.M., and Kelley, K. (2017). Antecedents of Information Systems Outsourcing Strategies in U.S. Hospitals: A Longitudinal Study. MIS Quarterly, 41(4), 1129-1152. Angst, Wowask, Handley, and Kelly (2017) explored information systems sourcing strategies in hospitals to develop an understanding of preferences between single-sourcing and multi-sourcing strategies and their antecedents. Organizations can employ single-sourcing strategies, where all information systems are provided by one supplier, or multi-sourcing strategies, which involve an integration of information systems from a variety of suppliers. Both sourcing strategies come with advantages and disadvantages; for example, single-sourcing allows for a more cohesive system, but one supplier may not be able to provide a sufficient product in all required areas, while multi-sourcing allows for superior products for each domain, but might result in additional IT costs or inter-system communication issues. That being said, results considering nearly all U.S. hospitals over a nine-year period from 2005 to 2013 using sequence analysis across the five IS modules indicated that hospitals were transition to single-sourcing strategies. This finding is counter to larger firm trends favouring multi-source systems. However, the rate at which the hospitals are transitioning to a single-source system depends on various institutional factors. Leveraging institutional theory, Angst et al. (2017) proposed that organizational antecedents such as strategic orientation (for-profit versus non-profit and teaching versus non-teaching), formal structure (size as the log of the number of hospital beds and membership of larger health systems), and internal dynamics (patient case complexity) will impact hospitals’ rates of transition. Results indicated that there was no significant difference in transition speed between for-profit and non-profit hospitals, teaching hospitals moved towards single-source more quickly than non-teaching, larger hospitals moved towards single-source more quickly than smaller hospitals (which were employing single-source earlier on), hospitals in smaller health systems moved towards single-source more quickly than those in larger health systems, and hospitals with less complex cases move towards single-source more quickly than those with more complex cases in later years. 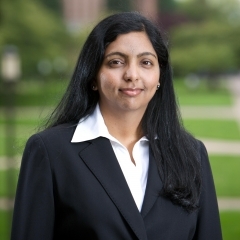 Anjana Susarla, (2012) Contractual Flexibility, Rent Seeking, and Renegotiation Design: An Empirical Analysis of Information Technology Outsourcing Contracts. Management Science 58(7):1388-1407. Although a substantial body of research recognizes that contracting for information technology (IT) services is inevitably incomplete. Since traditional complex IT outsourcing deals require long-term contracts, renegotiation design plays a more crucial role compared with that rent-seeking in other industries. However, two empirical challenges hampered the deeper exploration: the lack of appropriate data and the lack of rigorous identification strategy. The author addressed the gap by using a unique sample of 141 IT outsourcing contracts and by measuring the renegotiation decision results via Pareto improving amendments. To get a deep insight into the renegotiation, the author examined the role of decision rights delineated ex-ante in enabling Pareto improving amendments and in resolving the trade-off between adaptation and rent seeking. To address the endogeneity of the relationship between ex-ante decision rights and Pareto improving amendments, she used a contract date prior to 2000 (coded as a binary variable) as an instrumental variable that affects the presence of flexibility provisions. The results show that flexibility provisions, termination for convenience rights, and contractual rights whereby vendors are granted rights to reuse know-how are associated with Pareto improving amendments. The results are robust to potential endogeneity of contractual provisions when parties have the feasible foresight and to the possibility of adverse selection in the sample. This work contributes to the literature by empirically showing the role of renegotiation design in fostering flexibility in IT outsourcing and by highlighting the nature of investments in the IT context and the implications for renegotiation design. A complementary approach is to examine the role of relational contracting that enables joint governance and resolution procedures. Published February 22, 2018 | By Min-Seok Pang, Ph.D.
Dr. Anjana Susarla at Michigan State University will join us as a guest speaker on February 28. Her bio is available at https://broad.msu.edu/facultystaff/asusarla/. Please read her papers and bring a question to her. We will discuss Susarla et al. (2011) and Bapna et al. (2016) when time permits. Week 6 – What makes a good teacher? S: I do not have one favorite teacher inspiring me, but I like some aspects of different teachers. For example, they care about the students, not just the number of scores. In my class, I try to remember students’ names. It’s hard, but it is something good to try. It shows that you care about them. S: My favorite teacher is my advisor when I was a master student. When I started research, I knew little about it. My advisor gave me a lot of hands-on advices such as how to collect data, how to write a paper. She was busy, but she still spent a lot of time on student. Besides, she is very passionate about her research. She is a role model for me. S: I want to talk about my Chinese verbal teacher in my 7th grade. At that time, I was very shy and not good at speak in front of people. The teacher made a lot of try to encourage me. For example, he asked us to describe a latest news in front of class every week. He tried to open my mind and speak in public. He changed my life. P: A good teacher is someone inspired you. He or she cares about students, gives an opportunity to change the student’s life. It is hard to say which aspect is the most important, there are different aspects matter for students in different stages. S: My favorite teacher is a mathematics teacher who helped me in the college entrance exam. With his help, I became strong in Calculus at that time. S: I think for a teacher, it is hard to inspire every student. But there are a lot of little things you could do. You need to be organized, preparing for the class, doing a good time management, sending students emails to remind them of homework. P: I know there are professors who have a class at 9:00. They will arrive at 9 and start to prepare for the slides, then the exact time when the class begins will be 9:05. Do not do that. You should arrive earlier for preparation work. This is a small thing, but it’s important. You need to show that you are ready, well prepared and professional. S: I like the teachers who do not just teach based on the lecture notes or textbooks. They will extend from the text book and teach something else within the current topic. And a good teacher should be encouraging, always inspire students. They should be approachable, not only in class, but also by email, office hours though they might be busy. P: The teacher need to be a good guy. You could not be a different person in class through the whole semester. If a teacher is not a good person, he or she doesn’t care about students. Students will know that. S: And a teacher should think the course is important and put effort in it. If the teacher doesn’t think the course is important for them, the students would not think it’s important. P: This is what I am doing for this class. Teaching a doctoral seminar means I need to spend one day to reading all the papers which we will discuss each week. Compared to teaching undergraduate or MBA courses, teaching doctoral seminar means more effort. S: One teacher I like often thought of some games or tools to help us understand the difficult concepts. He was well prepared, and students will know that he put many efforts in it. P: You mean that the class is not just about lectures, right? Here is something very important. The more you talk, the lower your teaching evaluation would be. A good teacher should interact with students, provide many different ways for students to understand. There is a study about different ways for learning: Reading textbook, listening to teachers, talking as a group, watching videos, practicing and teaching others. Reading and listening are not the most effective ways because they are passive learning methods. Teaching is a very good way. I am practicing this method right now. Each week I asked you to summarize the paper and explain it to others, it is a good way to understand the paper. Something fuzzy might become clear when you explain to others. And I always asked you to tell us what you think in your mind. Something will become concrete when you organize it in your mind. S: Sometimes a big name in academia will inspire students. P: I think it is very important to inspire students, but it is difficult. S: Doctoral students are motivated, but for undergraduate students, some of them do not care about the classes. They even do not want to make a cheat sheet for exams, it seems that they do not care about this degree. P: This is the 2nd point I want to emphasize. It is very important to convince your students why this course is very important. Especially for MIS field, although students are forced to take core IS course, they do not think it is necessary for business students. I spent a lot of time to explain why we need to care about technology and this IS course. For those which are not core course, students choose them because they have enough motivation. But for core course, the teacher should try to convince them. Another key ability a good teacher should have is to think from the student’s perspective. When you are designing slides and homework, think about effectiveness from a student’s perspective. Are they going to enjoy this? It is not saying that just to make students happy. But we need to make the course durable, enjoyable and student could learn something from it. One example is about deadline. If you set the homework deadline to Friday, there is always students asking whether they could have an extension. So you could specify the penalty, for example 10% deduction after Friday submission. Things could happen to students so there should be some flexibilities. Here is something I found useful when I am teaching. I will give unofficial grades in the middle of the semester. Because students are anxious when they are waiting for the final grading. If I tell them the unofficial grades of B- in the middle of the semester, they would be not that surprise when they find their final grading is B because they already know their performance. S: I think it is good if you give students feedbacks. I will tell students their performance in the previous sections. If they don’t do well, they still have a chance to fix it. In addition, I will design the course to make sure it includes different ways for grading, test, group study, project, etc. P: Business school usually emphasize active learning. They care about students’ participation, but sometimes they just kill introverts. There is an article online “When Schools Overlook Introverts”. When I was in University of Michigan, I was required to take MBA courses in Marketing and Finance. It was a nightmare. Look back the experience, I knew that someone just hate participation in class. So, I use in-class participation and online participation when I am teaching. Students love that. The principle behind this is, understand what the students think. S: That’s what I did in class. If someone likes answering questions, let them do. If someone don’t like it, don’t force them. P: It is true that some students will dominate the class. Sometimes I will wait and ask whether someone else would like to answer the questions. Teaching is important, you have to put effort, try to get high teaching evaluations, and develop your own best practice. When you just at the beginning, you need to take a lot of effort, but it will get easier after you figure out all of these. There is a resource which would be helpful – Temple University Center for the Advancement of Teaching. There are several programs and events you could take. When you are doing a TA, you could learn a lot by actively involved in the class. There are two senior students sitting in my class, we will review the class together after each class. What went well, what went wrong. They could learn a lot from it. S: I have a question about how to arrange the time for your teaching work. I think most of the research universities require teachers to teach three each year. P: Yes. There is a tip when you are choosing the university if you have options. Life in a university with big undergraduate program will be easier. Because the same course will be opened multiple times, then you just need to prepare for one course material but teach them several times. It is good for both teaching and research. Paper: Li, C., Peters, G.F., Richardson, V.J. and Watson, M.W., 2012. The consequences of information technology control weaknesses on management information systems: The case of Sarbanes-Oxley internal control reports. Mis Quarterly, pp.179-203. Academia research holds different opinions toward the SOX (Sarbanes-Oxley Act) act and some scholars claim SOX is bad for business organizations because of the additional regulations and burdensome expense, while others consider SOX is good for business organizations since it helps firms to point out deficiencies in information system. This research builds up on the findings of Feng et al. 2009 and considers the extent that the existence and resolution of information technology control weaknesses impact the ultimate usefulness or quality of the information produced by the financial reporting system(FRS). The author hypothesizes that the stronger (weaker) IT controls over the FRS, the higher (lower) the information quality produced by the system. The authors use the firm’s SOX 404 Management Report on Internal Controls to identify the material weakness of IT controls, and categorize the control weakness across three dimensions: 1. Data processing integrity, 2. System access and security, 3. System structure and usage. The authors find that firms reporting IT material weaknesses in internal control tend to have significantly higher management forecast errors than firms reporting either effective internal controls, or non-IT material weaknesses, accounting for firm size, financial performance, and earning characteristics. The regression analysis finds that both IT control material weakness and non-IT control material weakness are positively correlated with the forecast errors, but the magnitude of IT control material weakness is more than 3 times larger than that of non-IT control material weakness. The authors also find that the material weaknesses on processing integrity has the strongest impact on the forecast errors. turnover.Results also show that IT Architecture,IT Control Oversight–External are significant predictors as well.It also shows that IT Control Oversight–Internal to be a strong predictor.The results are robust and Heckman model controls for any endogeniety concerns due to selection bias.The the findings suggest that CEOs and CFOs were observed to be selectively affected by serious IT deficiencies. For CEOs, deficiencies traced to IT Architecture and to IT Control Oversight–External were associated with higher turnover likelihoods. For CFOs, deficiencies traced to IT Control Oversight–Internal were associated with higher turnover.Inconsistencies and limitations of the study are discussed.Contributions to IS,managements and practice are discussed. Xue, L., Ray, G., & Gu, B. (2011). Environmental Uncertainty and IT Infrastructure Governance: A Curvilinear Relationship. Information Systems Research, 22(2), 389–399. Extant research predicts that firms tend to decentralize IT governance in more uncertain environments. But empirical work in this area presents mixed result. To develop a deeper understanding of the relationship, this paper investigates the issue by studying the relationship between environmental uncertainty and IT infrastructure governance in a sample of business units from Fortune 1000 companies. Centralization of IT infrastructure provides the benefits of economies of scale as the same IT platform can be leveraged across different business units, thereby reducing the unit cost of IT infrastructure for each business unit. But when uncertainty increases, the benefits of responsiveness provided by more decentralized IT infrastructure governance are likely to outweigh the benefits of centralization. However, decentralization of IT infrastructure governance raises issues of control. When uncertainty increases from the intermediate to high level, firms may switch from decentralization to recentralizing IT infrastructure governance. The key proposition is that the relationship between environmental uncertainty and decentralization in IT infrastructure governance is best characterized as a curvilinear relationship. Moreover, the study proposes that business unrelatedness between business units and their headquarters moderates. The dataset is obtained from the CI, Compustat database, SDC Platinum Mergers and Acquisitions databases. Binary logistic regression model is applied to test the hypotheses. The result support all the hypotheses. The key theoretical implication of this study is that the relationship between environmental uncertainty and IT infrastructure governance is likely to be more complex than that suggested by the prior literature. This paper also provides practical implications to managers when they make IT infrastructure governance decisions. The Sarbanes-Oxley Act of 2002 had a pervasive influence on forms. Among many articles, SOX section 404 highlights the importance of controls related to the financial reporting function of management information systems, it requires a regular assessment of the quality of the financial reporting function, which provides conditions for this research. This paper examines how weakness in IT controls impact the quality of the information and cause poor forecasts. It also investigates how this relationship varies by the type of IT material weaknesses reported. The material weakness is defined as a control deficiency that results in a reasonable possibility that a material misstatement of financial information will occur without the being detected or corrected. The paper highlights the importance of IT in producing meaningful financial reports. Thus IT weaknesses will have a significant negative impact on data quality. So they propose for firms with SOX 404 IT material weakness will have lower management earnings forecast accuracy, comparing to firms have effective internal controls and non-IT material weakness. In order to investigate the different impacts caused by different IT material weakness, the author classifies the control weakness into three categories: 1. data processing integrity; 2. system access and security; 3. system structure and usage. It proposes that IT material weakness related to the data processing integrity category will have the greatest negative impact on information quality and forecasting accuracy. Their research model is OLS regression. The dependent variable is management forecast error, the focal independent variables are whether a firm has IT material weakness and the dimensions the weakness in. They collect data on SOX 404 report, financial report and forecast, the time span is 2004 to 2008. After a series of robustness check, the hypotheses are supported. This paper contributes to the IS literature by providing evidence linking overall IT controls and their relative quality dimensions to the quality of management decision outcome. Benaroch, Michael and Chernobai, Anna. 2017. “Operational IT Failures, IT Value Destruction, and Board-Level IT Governance Changes,” MIS Quarterly, (41: 3) pp.729-762. The literature on operational IT failures is sparse and focused on their value relevance to the firm. This work is among those that touch upon an important gap in the literature: the connection between operational IT failures and board-level IT governance. The goal of this work is to address two questions: 1) whether the negative impact of operational IT failures on firms’ market value a predictor of post-failure changes in the level of board IT competency, and 2) what are the specific determinants of board IT competency associated with these changes. With a concept-intensive but well-organized literature review and hypothesis development, the authors narrow down the research scope to empirically examine effects of the market value drop around recent operational IT failures on the change in the board IT competency level, specifically, a) increase in the ratio of independent directors with IT experience; (b) increase in the ratio of executive directors with IT experience; (c) turnover of a CIO serving on the board; and, (d) establishment of board IT committees. Utilizing data of 110 operational IT failures from U.S. public financial firms from Financial Institutions Risk Scenario Trends (FIRST), the results demonstrate that subsequent to experiencing operational IT failures, firms make improvements to the IT competency level of their boards, and the improvements are proportional to the degree of negative market reaction. However, those improvements are only on the executive side of the board, namely: an increase in the IT experience of internal (executive) directors and an increased turnover rate of CIOs serving on the board. Furthermore, the likelihood of CIO turnover is lower in IT-intensive firms where such turnover could be more disruptive. This work not only contributes to IT government literature by exploring the critical connection between operational IT failures and board-level ITG, but also offer the industry with grounded managerial operation guidance. Banker, R.D., Hu, N., Pavlou, P.A., & Luftman, J. (2011). CIO Reporting Structure, Strategic Positioning and Firm Performance. MIS Quarterly, 35(2), 487-504. Since the emergence of the CIO position, academics and practitioners have struggled to identify the ideal CIO reporting structure. Banker, Hu, Pavlou, and Luftman (2011) provide insight by considering the alignment of a firm’s CIO reporting structure and its strategic position. Industry information has shown that the majority of CIOs report to the CEO or CFO and thus Banker et al. (2011) used a dichotomous operationalization of CIO reporting structure. Following Porter’s (1980, 1996) theory, Banker et al. (2011) considered two generic strategies: differentiation and cost leadership. Differentiation is pursued when firms focus on providing products/services that are superior in terms of designs, innovation, development, engineering, customer intimacy, and/or brand image. Conversely, a cost leadership strategy is perused by achieving economies of scale, cost efficiencies, and operational excellence. It is important to note that these generic strategies are not mutually exclusive; firms attempt to effectively balance both while pursing one main strategy. To operationalize, Banker et al. (2011) used an external assessment, specifically profit margin for differentiation and asset turnover for cost leadership, contrary to typical self-assessment methods. Finally, various control variables including IT intensity, IT orientation, industry technology level, industry concentration, and CIO tenure were employed. Banker et al. (2011) used 200 firms from 1990-1993, as well as 58 firms from 2006 as a robustness check, to investigate their hypotheses considering the alignment of CIO reporting structure and strategic positioning. Results indicated that strategic positioning influences reporting structure; differentiators favour CIO-CEO, while cost leaders favour CIO-CFO. Alignment of CIO reporting structure and strategic positioning positively affects firm performance (operationalized as abnormal stock returns and future cash flows from operations). Finally, the results highlight the fact that there is not a universal CIO reporting structure, but rather, the ideal structure is dependent on the strategic positioning of the firm. Published February 16, 2018 | By Min-Seok Pang, Ph.D.
Week 5 – Why Do We Need To Attend Conferences? S1: The goal of the organizer is to show the trends of academia, collecting the latest ideas from the whole fields. S2: Experts in different tracks come together to discuss their own research. They may come up with a new inter-tracks idea or evaluate the same methodology from different angles. S3: People or even co-authors from different counties can meet during the conferences. Prof.: Ture, exchanging ideas is a big part of attending a conference. How about others? S3: People from different colleges attend a conference. Networking is important for Ph.D. application. Before she applied Temple, she noticed a lot of applicants have already met the Ph.D. recruiters at the conferences. Prof. Why conferences have breaks? Even 30 mins break? Why do we need to network? Prof: We are in business School. Our papers are judged by other peers. No absolute double-blind reviewing. Therefore, networking plays an important role in the publication process. You need to build a group of researchers to connect with a pool of potential reviewers to nominate as reviewers. Before the publication, it takes years to revise the paper. Therefore, networking during these years is important. Prof. My first US IS conference is one of the awful experiences in my life. I did not know most of the attendees. Therefore, I just talked with some Ph.D. students. Today, those students currently researchers in different universities and they are doing quite well in IS research. The connection established several years and then last long during my career. I recommend you talk with people on a conference, starting from people from your own counties or same fields. Next time, talking with guest speakers you have met on MIS or your weekly seminars. Prof: How to choose Conference? You may need to focus on small conferences. S2: Large conference may involve a lot of topics may quite unrelated to your owns. Prof: I will show you the difference between large conferences and small ones. Prof: AMA and ICIS are too big to have an opportunity talking with others. The likelihood to meet the people next time is relatively low. It is important to take a home conference to attend every year. S2: Then you can build your own reputation within a group. Prof: You need to attend the home conference serval times. The people will know you for years. Conferences are evolving. WISE is turning crowed. Then small conferences pop up, such as SCECR, CIST. Attending these small conferences every year and do not hesitate to join the social events. S3: How about NBER workshops? Prof: It is not the core group of IS. We need to keep in touch with the core senior researchers within your own fields. You may lack connection with people in other fields. I attended some public policy conference. I find it is hard to get in the other groups. Then I just attend them and present my papers and learn new ideas. The networking function of the attending a conference cannot be my first priority. S2: How to follow up with the people we meet after conferences? Prof: Emails, SNS, you can contact them by different means. We teach SNS; we should use it. S3: Also attending a conference it more like a self-branding process! S4: I find it is hard to talk with others during a conference as a junior Ph.D. student. Do you have some suggestions? S3: Stay with your advisors, s/he will help introduce you to the related researchers when you attend your first conference. Prof: Remember not to do this when you are on the market! You should be an independent researcher by then. Prof: More, try to be the conversation starters by reading their papers in advance and follow them on SNS, etc. Narayan Ramasubbu, Chris F. Kemerer (2016) Technical Debt and the Reliability of Enterprise Software Systems: A Competing Risks Analysis. Management Science 62(5):1487-1510. People know that software reliability is crucial for business, especially enterprise software systems, such as ERP, Server OS. In daily practices, however, developing and patching a software to keep reliable is costly due to the interdependencies and potential for conflict between the underlying, vendor-supplied platform and the customizations done by individual clients. Some engineers then take shortcuts to avoid huge working load. Then the reliability of systems shrinks since the shortcuts to rapidly deliver the functionality demanded by business trade off the potential longer-term benefits of appropriate software design investments. These designs are called technical debt. Few study focused on the empirical explore technical debt since the Interdependencies, by nature, make it difficult to measure and assess the impact of technical debt on system reliability. The author proposed a classification of systems failures-client errors and vender errors-to overcome the measurement difficulty. Analyzing a longitudinal data set spanning the 10-year life cycle of a COTS-based enterprise software system deployed at 48 different client firms with a survey analysis, the authors find that 1) technical debt decreases the reliability of enterprise systems and 2) modular maintenance was approximately 53% more effective than architectural maintenance in reducing the probability of a system failure due to client errors and 3) it had the side effect of increasing the chance of a system failure due to vendor errors by approximately 83% more than did architectural maintenance activities. The authors showed that how firms could evaluate their business risk exposure due to technical debt accumulation in their enterprise systems, and assessed the estimated net effects, both positive and negative, of a range of software maintenance practices.